Some people can not start a day without coffee. If you are one of them like me, you know how important it is to find a right coffee tumbler since you need your coffee all along the morning. 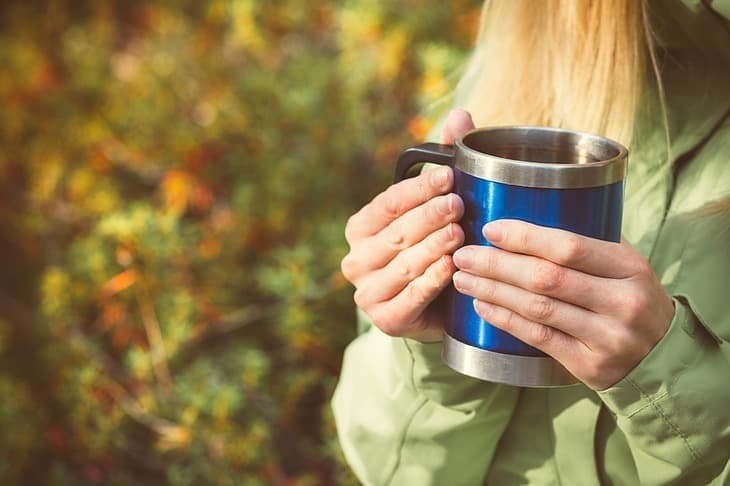 Whether you enjoy sipping coffee slowly and want it to stay warm for hours or you face a lengthy commute each morning, coffee tumblers are a fantastic way to stay caffeinated when you're on the go. The best coffee tumbler will reflect your style and personality, but it should also fulfill some basic requirements regarding size, durability and convenience. First, I will give you a few basic standards for a perfect coffee tumbler that suits your own need, and then my top picks of the best coffee tumblers on the market. This an updated review for March 2019. The Bev-Tek 20 oz Vacuum Insulated Performance Pint Travel Tumbler Cup which was our top pick for 2018 has been replaced with our new favourite The BEAST 30 oz Black Tumbler - Stainless Steel Vacuum Insulated Rambler Coffee Cup Double Wall Travel Flask. 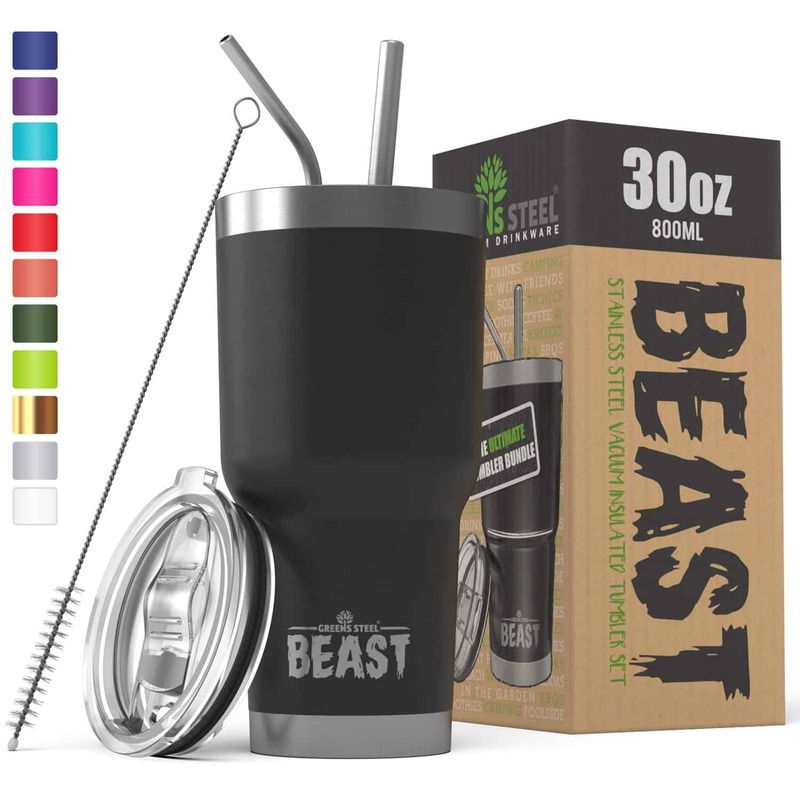 ﻿BEAST 30 oz Black Tumbler - Stainless Steel Vacuum Insulated Rambler Coffee Cup Double Wall Travel Flask. One of the first things to consider when shopping for a coffee tumbler is how much liquid it can hold. If you are content to sip on eight ounces of java in the morning, then a tumbler with a relatively low capacity will be more than enough. However, many coffee drinkers prefer a capacity of 18 ounces or more. This means that you can fill up once and get your caffeine fix for hours, which is ideal for longer car journeys or just a particularly tough day at the office. With capacity in mind, it becomes clear that the insulation and temperature control of a coffee tumbler are incredibly important. After all, there is no point in filling up your tumbler with 30 ounces of hot coffee in the morning if it will reach room temperature in less time than you can drink it. Looking for tumblers with added insulation or a stay-warm guarantee for a set number of hours can ensure that you get a vessel that lasts as long as you need your coffee hot. Staying hot is definitely cool. Although people use coffee tumblers for all kinds of events and in all types of environments, there is no question that commuters find them especially helpful. If you regularly drive to or from work and sip from a coffee tumbler in the process, then you understand the importance of tumbler size. 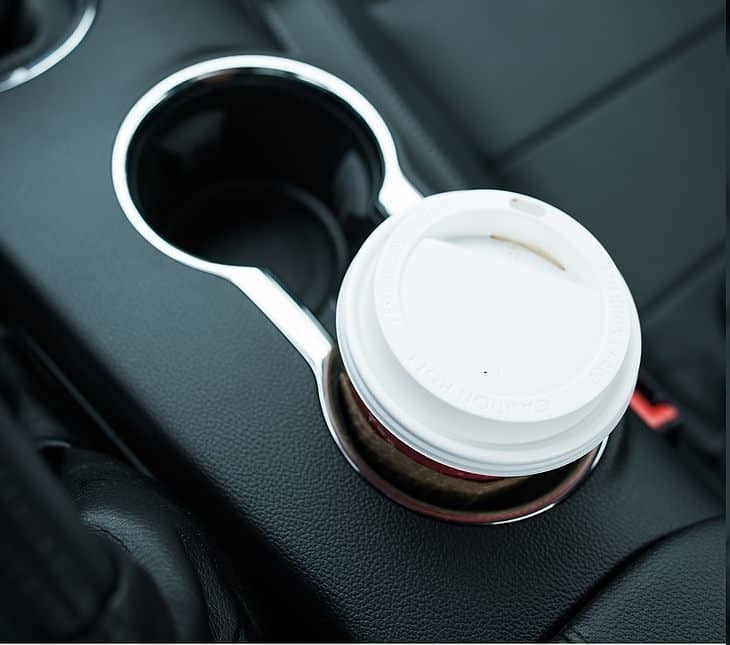 If the base of the tumbler is too big, then it might not fit into the traditional cup holders of a vehicle. Looking for a slimmer, taller coffee tumbler increases the chance of it fitting into your car for your morning commute. Many people use their coffee tumblers on a regular basis, which means that it is important to keep it clean and wash it after each use. Unfortunately, there are some coffee tumblers that can be difficult to clean. A long, thin and narrow tumbler that you can't fit your hand into may be challenging to reach the bottom of, and this can cause hygiene problems over time. There are also tumblers that can't go in the dishwasher safely. If you're concerned about the hassles of keeping a tumbler clean, opt for one that is either dishwasher-safe or one that has a wider body and can be easily cleaned by hand. Today, most of the best coffee tumblers come complete with a secure lid. An included lid means fewer spills, even when your tumbler is filled to the top and you're on the go. Look for a lidded tumbler that has a tight seal as this will further reduce the potential for spills. Also, check for the mouthpiece in the lid. A larger hole for the mouthpiece makes sipping easier, but it cools the coffee down faster and can make spills more likely. A smaller mouthpiece makes it slightly more difficult to drink through the lid, but it can go a long way in maintaining the liquid's warmth and preventing spills. Ultimately, the best mouthpiece will depend on whether you drink your coffee at once or whether you need it to stay warm for hours as you slowly sip the contents of the tumbler. 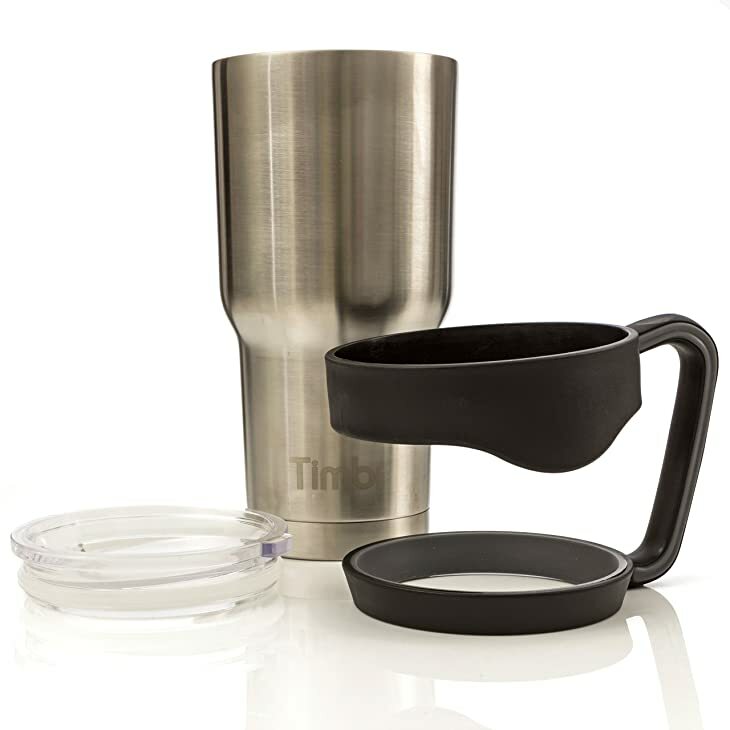 As you browse coffee tumblers, give some thought to how easy the tumbler will be to handle. When filled with a boiling-hot liquid like freshly brewed coffee, many materials will also warm up, making the tumbler hard to touch and handle without getting burned. Thankfully, most coffee tumblers address this issue. Some have an extra layer of insulation to protect your hands, and some add in a plastic grip to reduce spills and slips. In many cases, adding a handle to a coffee tumbler gives it the best security and makes it incredibly simple to drink from. 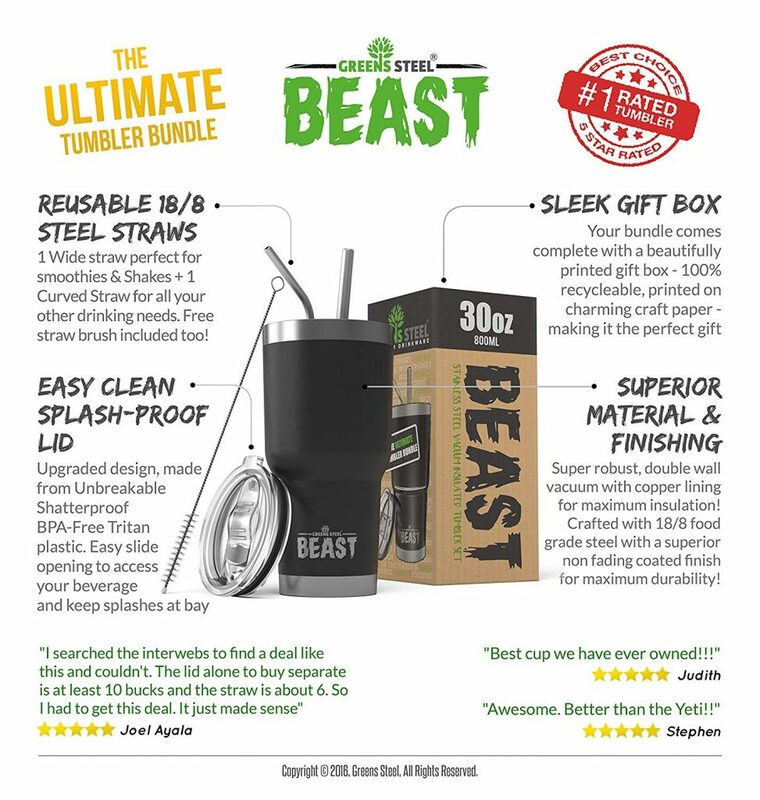 The Beast 30oz Tumbler is in a league of its own and completely lives up to it name. It's available in a variety of fabulous colour and 2 sizes. 20 and 30-ounce. Although we are talking about a coffee tumbler, it is also perfect for smoothies and cold drinks. It comes with 2 steel straws which are reusable and eco friendly. You have the option for an extra $9.99 (30oz) to purchase handle which is a big plus for me. I love the style, the look and quality. Convenient 20 and 30-ounce size. Works with both hot and cold beverages. Handle is optional but not included. Straw can be noisy as it rattles around a bit! 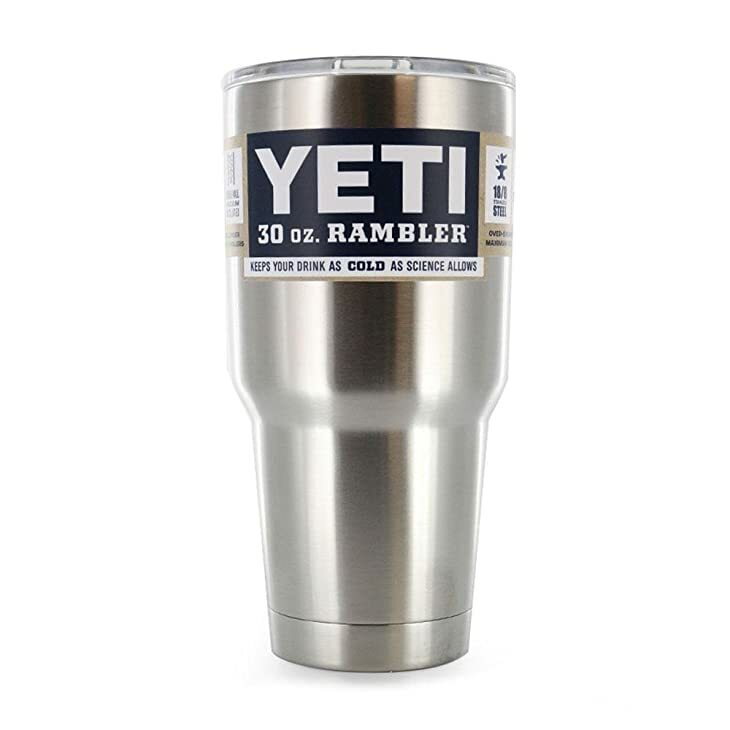 The Yeti brand has a reputation for keeping cold drinks chilled for long periods of time, so I was curious to see whether the Yeti Rambler 30-Ounce Tumbler in Stainless Steel would do the same for hot coffee. The tumbler does offer plenty of heat retention, but the mouthpiece's straw opening is always open, which reduces how long liquids can stay hot. While the tumbler itself is very durable, the gasket connecting the lid and the tumbler can wear down easily, making replacement nearly inevitable after six months. The large tumbler also doesn't come with a handle, which can make it heavy and hard to handle if it is filled to capacity. At this high price point, it came up slightly lacking for me. Large 30-ounce size holds plenty of coffee for most people. Suitable for hot and iced beverages. Made from durable and food-safe stainless steel. Can be damaged if placed in the dishwasher. Rubber gasket between tumbler and lid can wear away and reduce efficiency. Susceptible to spills thanks to an always-open mouthpiece. No handle for easier use. 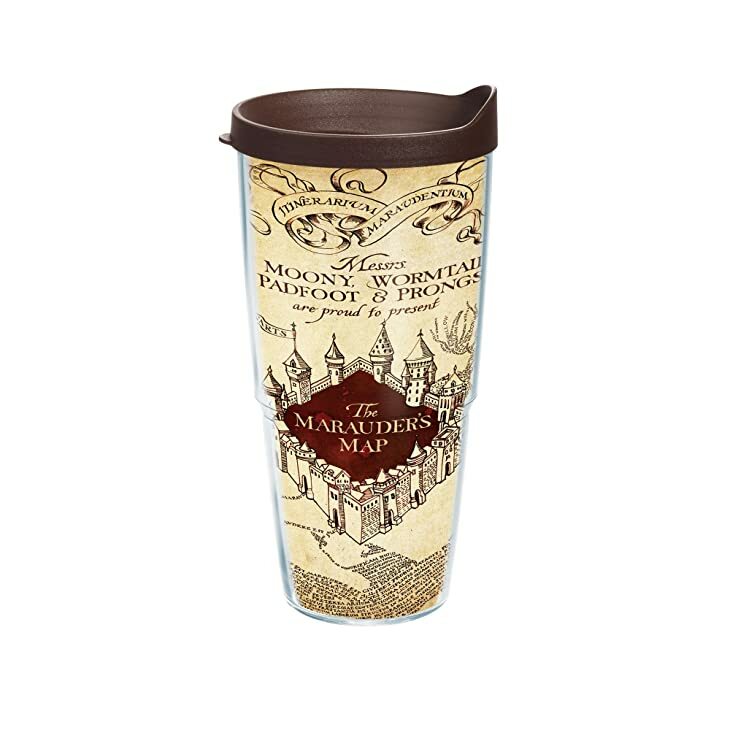 At first glance, the Tervis Harry Potter Marauders Map Tumbler is a clear winner. Anyone with a passion for Harry Potter will instantly identify the famous map and appreciate the attention to detail on the graphics. 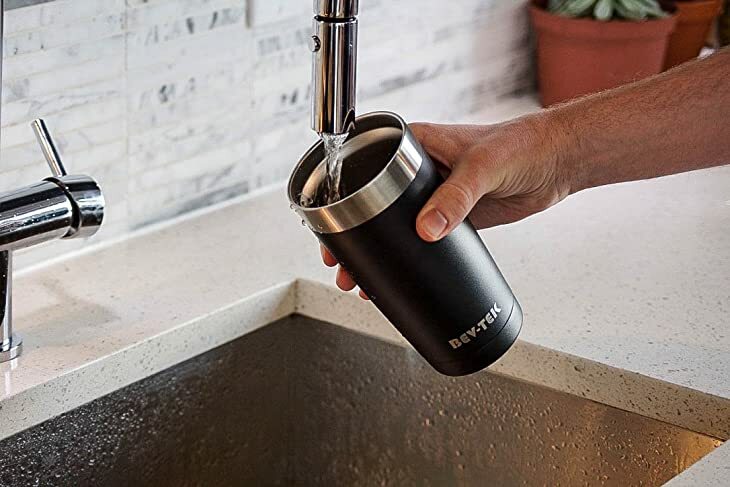 The coffee tumbler itself is suitable for hot or cold drinks, but it isn't ideal when it comes to keeping liquids hot for long periods of time. Overall, this tumbler seemed to fare better with keeping iced coffee chilled. The coffee tumbler is safe for microwave use, however, and this made it easy to warm up the contents when they got lukewarm. 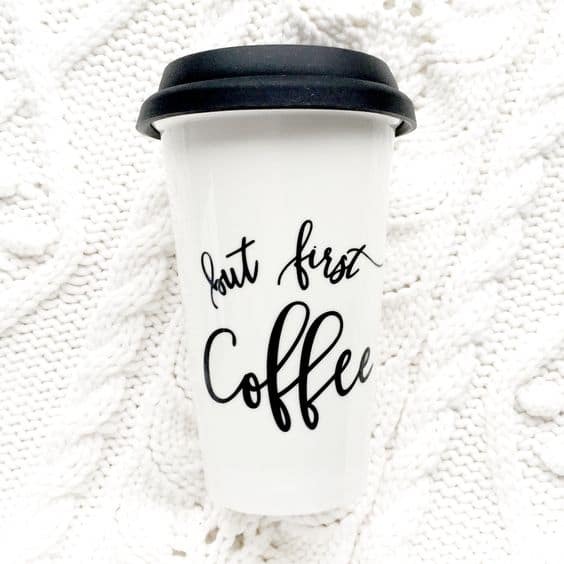 While this is a fun novelty gift, it might not be great for someone who wants to sip their coffee or keep it warm while on a long car journey. Fun, whimsical design is perfect for any Harry Potter fan. Free from BPA and melamine. Design doesn't completely wrap around the tumbler. Coffee won't stay piping hot for very long. Doesn't come with a handle and has no textured exterior. If you look at the Timbr Tumblers 30-ounce tumbler on its own, it is clearly a durable, attractive and appealing vessel perfect for travelers or commuters. However, I was less impressed once I started to look at the various accessories it comes with. The idea of an optional handle that can slide on and off the tumbler is promising, but I found it difficult to put on or take off when the tumbler was full of hot coffee. Once again, this tumbler has a clear lid, which I found unappealing since the material can begin to look worn after just a short period of time. There is a 100% money-back guarantee that makes me feel more positive about the durability of the tumbler and its accessories. Double-vacuum insulated tumbler walls regulate temperatures for hours. Wide enough to clean by hand. Includes a 100% money-back guarantee. Comes with a clear lid and an optional handle. Incredibly durable and made to last without rusting. Difficult to add or remove the handle when tumbler is full of liquid. Hole on the lid can never close, which negatively impacts heat retention. When handle is attached, tumbler may not fit all standard cup holders. 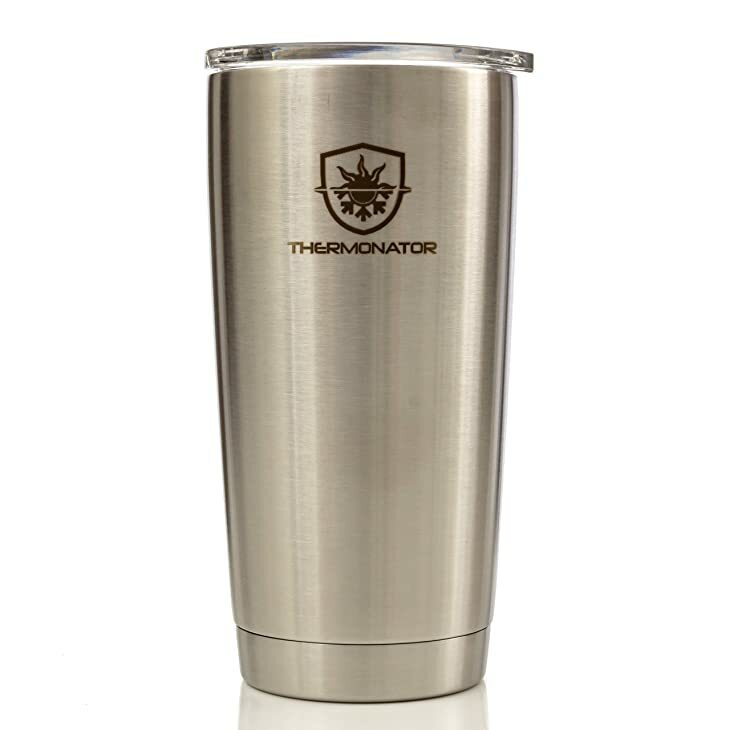 The Thermonator 2X Insulated Stainless Steel Travel Tumbler has a sleek design that makes it look more expensive than its price tag. Unfortunately, the exterior of the tumbler can be difficult to hold securely when it is wet, particularly since there is no handle. The ergonomic design does help it to fit cup holders perfectly, but the narrow shape means it is difficult to keep clean unless you place it in the dishwasher. The tumbler comes with a clear lid that starts to show wear and residue over time, which isn't pleasant to look at when you're drinking out of the tumbler. The lid also has a convenient hole for a straw, but most users won't use one with hot liquids, and the hole can therefore be a spill hazard rather than a benefit. Vacuum insulation keeps coffee hot for several hours. The 20-ounce size is ideal for coffee drinkers. Tapered and ergonomic design fits into your hand and the car's cup holders. Made from a durable stainless steel that won't rust. Smooth surface and no handle can make handling the tumbler difficult when wet. Clear lid can start to look grimy over time. Hole in lid ideal for straws but tough to drink from. Stainless steel for maximum heat retention. Sleek black layer that made the tumbler easy to grip. Coming in at 20 ounces, a perfect size. The top tumbler when it came to preventing spills. Good for both hot and iced coffee. The price point is much lower than some of its acclaimed competitors. Have you found this review helpful? If you recognize any of the coffee tumblers on this list or if you have your own opinion about where to get the best coffee tumbler, leave a comment below or share this post! If you're looking for a kettle to boil water for ​your coffee, have time to check out 5 Best Kettles For Gas Stove or 5﻿﻿ Best Whistling Kettle﻿﻿.